Repertoire, with links to most of the melodies introduced on this website. Teaching (included under "Learning to play the qin"). 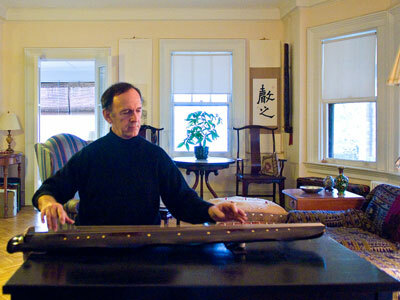 My professional focus is helping to restore the world's oldest living written instrumental music tradition, that of the Chinese guqin silk-string zither. That the guqin music I play is both beautiful and transporting is due less to me than to the beauty of the materials I am working with: the melodies written down in great detail long ago, the instrument with its rich colors and long-lasting tradition, the rare beauty of silk strings. Indeed, the philosophical, historical and musical qualities of the guqin suggest to me that, as China continues to recover and develop her traditions, the revival of early guqin music is inevitable. If in this process my own experiences allow me to play a contributing rôle, perhaps it could be in the following ways. As a music reconstructor, continuing to restore early guqin melodies. To date I have personally reconstructed/restored over 200 such melodies from tablature dating from the 7th to the 17th c. CE (partially reconstructing more). The nature of the written sources, plus the fact that most of this music is no longer played by anyone else, requires treating these sources both analytically and creatively. As a musicologist, studying very thoroughly the modal and melodic nature of individual melodies and their gradual change and development. Because the number of old melodies thus analyzed is still small compared to the large amount of surviving qin tablature, these studies must continuously be expanded and updated. Only then will we have guidelines that allow creative performances within the playing styles of particular regions, time periods, or qin schools. As a music historian, doing research into the background of the instrument, its music, the musicians and the melodies. This requires extensive research into secondary sources as well as making translations from the enormous amount of material available in primary sources, most of it in classical Chinese. As a musician, giving historically informed performances of these melodies, both live and for recording. These are based on the music reconstruction, musicology and historical work, all of which are necessary if the result is to be the both accurate and creative revival of an ancient tradition. In addition, the tradition being to play for oneself or for a few friends, performances should originate from and reflect this ideal. None of this conflicts with making new qin music - I have also done some of this. The important point is that with all great music the beauty is in the performance as much as in the musical material itself. For this reason public performances must be of high quality and in an appropriate setting. "Appropriate" may not be the same as "traditional". Traditionally the qin was played only for a small group of friends. With a larger audience a quiet modern recital hall with good acoustics, where one has to imagine a traditional setting, is preferable to a noisy traditional hall or garden, where one has to imagine the music. Likewise, the depth of listeners' appreciation is related to their musical, historical and philosophical understanding. Thus explanations must be accurate and understandable to the layman as well as useful to the scholar. The present website is dedicated to the achievement of all these goals.